For Uncle, a lecherous but handsome toilet designer, it is just an ordinary day of neglecting his duties as a single parent to hit on women and talk about his "superpower": his ability to tell a lady's hip size at a glance. But when he is sucked down into a toilet, the Space Peace Republic Alliance Hero Committee gives him real superpowers, and he becomes the hero of Earth. There is only one problem–-he has become an ugly, unrecognizable fatty who is unable to reveal his real identity. Full of sexual innuendo and slapstick humor, To Be Hero follows Uncle as he befriends bizarre allies and combats even more bizarre foes, fighting for the future of earth against aliens and—more importantly—his future with his daughter. At 11 minutes an episode for 12 episodes, this show ends up being roughly the length of a movie. From the audacious (and perverse) characters and sometimes immature humor it isn't a show for everyone, but if by episode 4 you haven't been repulsed, then you will most likely continue to enjoy the show. By far, the greatest part about this show is the ending theme song, which is infinitely catchy. I would recommend spending the 1 minute of life on youtubing it. Even if you have no intention of watching the show it would be a pity to pass up that catchy tune. I found that the story was, in many places, metaphorical after you strip away the ridiculousness. For example, everyone has read in the synopsis that the main character is a toilet seat designer. This would otherwise be completely ridiculous, however, if you say, "He is a businessman and in the eyes of his family whom he neglects due to overwork, he might as well be selling toilet seats," things can make more sense. Another example is his drinking and chasing after women is a coping strategy for his stress and not his aloof nature portrayed humorously. This story is all about the depressed main character fighting to protect his daughter and his love for her. This feels like a budget project. Things seem hastily drawn and there will be no scenes that truly scream, "Beautiful." Rather, this show really focuses on it's core, which is humour. The animation is a mere medium used to only convey the story. So if you watch shows mainly for good graphics like "Attack on Titan" this will leave you disappointed. On the other hand, if you like shows like "Kaiba" then this show seems to embody the concept of ... story > animation ... it will leave you satisfied. There are many places throughout the entire show where I couldn't help, but think, "Ah, the animators are breaking the fourth wall and trying to pass off their animator insider jokes to their colleagues." The main character is a very loving and protective father placed in a desperate and depressing situation. The only character that isn't stupid, gross, perverted, depressing, or otherwise bizarre is Min-chan, the daughter of our main character. All the antagonists are gag characters, but they serve their purposes. Chicken, shrimp, monkey, "the wife", prince, demon king. Once again, that ending them is just too wonderful. Besides that everything else is mediocrity. I cringed and laughed throughout this show. Sometimes the humor was hard to swallow and the characters too depressing, but overall it was a surprisingly okay story better than 6/10, but less than 8/10. Hey folks, this will be a review for To Be Hero. This show was a ton of fun to watch. From what I watched and from what I read, this show is one of those easily misunderstood shows. People quick to judge or brush off certain types of comedy or art will drop it quickly and deploy a cunning, yet inaccurate written assault to hopefully dissuade you from watching it. I on the other hand bid you to give it a chance. The story is a bit two fold. The first and more obvious story is Ossan becoming the superhero. A once handsome man who uses toilet knowledge to hit on countless women happens to fall into the toilet. This takes him to a mario esque person who bestows upon him the title of hero and sends him back to our world as a fat man. From here he must protect our world and his daughter from aliens. This side of the story is rather spoofy and though fun to watch not very interesting. The second fold of the story is the reasons behind Ossan's actions, and his connection to his daughter. They do make this side of the story lighthearted and even treat it as a joke when the show comes to and end, however it was still pretty interesting. The art was actually really well done. The soundtrack was alright, the ending song was super catchy. The characters are all pretty crazy and interesting. I enjoyed this show a lot. I was worried it was going to be one of those bad spoof shows, but instead it was a great one. Potty humor, and whether or not your too mature to enjoy the comedy aside the shows story and moral backbone is pretty decent. The art and sound both were pretty darn good and its only 11 minutes per episode which means you wouldn't even be wasting time. The comedy seems to be the biggest issue in this show. I happen to enjoy the fast paced over the top comedy the show presents. There are poop jokes, but that's not all the show has to offer. Though honestly, I'm not really sure why people are so adverse to that type of humor. The comedy sort of comes in waves, starting small and obvious and builds into more and more higher bar. Its all pretty filthy and sometimes twisted, but overall I feel like it enhances the experience. TLDR: Give it a shot, its short and funny. There is a hidden story, but also it can be viewed for straight comedy too. 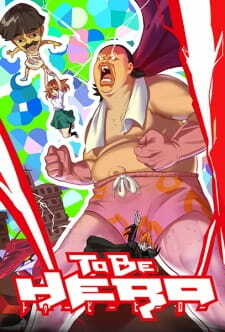 To Be Hero is a very interesting anime. A lot of people will be turned off from this show because of the flavor of the humor, the extremely weird/out there plot/premise, and the unattractiveness of many of the character designs. I truly believe there's something special here though. Even though this show is a comedy, and I would agree comedy is the best genre to put it in, the comedy is not the reason I think so highly of this show and the comedy is not the reason I would recommend this show. You will know pretty quickly if the humor in this show is for you or not, however it's hard to nail down what's good about the humor because the reasons I'm sure some people dislike the humor are the same reasons some people like the humor. The art, sound, and animation in this show are all great, not incredible or otherwise mindblowing or outsanding, but defintely great. Every character's design is unique, the animation is never low quality (in fact there's some very high quality animation at the end of the show), and the music fits everything perfectly although no one track besides maybe the ending theme really stands out or is overly memorable. The story and characters are the highlight of this show, and are the reason I enjoyed it so much I'm sitting here still thinking about the show and writing a review for it days after finishing it. While the plot can be hard to follow at times, it is never so out there that you can't follow it. The story is a lot more about Ossan's relationship with and protection of his daughter than the synopsis would have you believe. Underneath the humor is a great story about a father and his daughter and the interesting people around them every day. The main cast in this show all do a great job of making you care about them. I never thought I'd care so much about a creepy pervert neighbor or a computer alien that has access to all the knowledge in the universe. I was always on Ossan's side and wanted to see him succeed in everything he attempted, I wanted Min-chan to be happy, i wanted the alien prince to be happy, I liked everyone a ton and even in all the absurdity the show made sure everyone in the main cast developed and were believable in their actions. As I end off this review, I should say that the number 1 thing this show did right and that it does better than almost any other anime is endings. The end of almost every episode was a very well done cliffhanger that both made you really want to see what was going to happen next and was immediately resolved/addressed next episode. The ending of the entire show was fantastic as well, everything wrapped up in a way that was satisfying and really concluded the story. The final episodes of this show reminded me a lot of why I like anime, and the ending tied everything up perfectly in my eyes. If you've read everything up to now you might have forgotten this show was a comedy for a split second during my gushing, but that's the beauty of it. I was laughing the whole way through, but by the end I was truly invested in this story and it could not have ended more perfectly. Episodes are only roughly 10 minutes long each, which means at 12 episodes the full run time of this show is only about 2 hours. If you watch this show I highly recommend you treat it like a movie and watch it all in 1 sitting, and if you can manage I also recommend watching it with friends who can get caught up in this masterpiece with you. This is my first time writing a review and to be honest i enjoyed this anime it was really funny and the characters were really funny even if they had like 1 minute of screen time.However the ending to this anime was quite confusing (spoiler incoming) like when they said it was actually a other universe or something i was really confused but overall i really enjoyed this anime and looked forward to every next episode with full hype. I also think they should have added a little more episodes like 3 or 2 more but it did end with a fantastic but confusing ending and i loved it.